North Yorkshire property developer, Quattro Property Group, has unveiled the full details of its plans to transform the former Southfield office block site on Station Parade in central Harrogate into 20 apartments. With Leeds-based Castlehouse Construction appointed as contractor, works are now underway at Southfield House to redevelop the former office building into nine apartments whilst also creating an additional new apartment building, Ellis House, within the site’s existing boundaries to accommodate a further 11 apartments, all with undercroft parking. Revised planning permission for the development was granted in December 2018 and Quattro is expected to finish the build ready for launch in late 2019. Both buildings will be predominantly two bedroomed apartments with the inclusion of a one bedroomed apartment, all developed to the highest specifications. Sitting within a conservation area on the corner of Station Parade and York Place, Southfield and Ellis House will encompass frontages which will be sensitive to the surrounding area’s historical buildings as well as elevations that will ensure a balanced and symmetrical appearance. The building frontage is also set back with gardens to the front elevations. With coveted views of The Stray, one of Harrogate’s best known features, the new development is in an excellent location giving residents direct access to 200 acres of beautiful parkland whilst also providing a variety of shops and restaurants as well as quick routes through to Harrogate’s town centre. 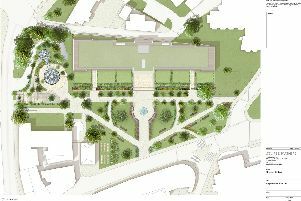 Richard Lumley, Chairman of Quattro Property Group, said: “We are extremely excited to unveil our vision for what is undoubtedly one of the best development sites in Harrogate Town Centre. "The Southfield residential scheme has been sensitively designed to breathe new life into this strategically located site whilst also uniting the development with the architecture of surrounding buildings to provide apartments of the highest standard. “Safeguarding the future of sites such as this is of critical importance to the long-term sustainability of the town and we are looking forward to seeing the work progress on site."